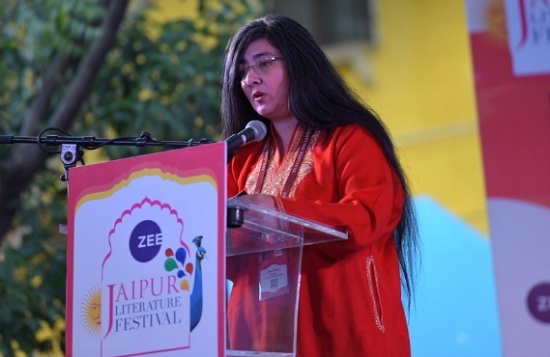 Jaipur : Author Charu Singh mesmerizing series, “The Maitreya Chronicles” second book “The Golden Dakini” was launched today at the Zee Jaipur Literature Festival by Andrew Quintman, Associate Professor of Religious Studies, specializing in the Buddhist traditions of Tibet and the Himalaya, in the Department of Religious Studies at Yale. This was followed by conversation with Charu Singh on her book. Charu Singh read out a portion of the book at the front Lawn. In this spellbinding sequel to “Path of the Swan”, Charu Singh deftly draws on the rich heritage of Tibetan-Buddhist mythology to immerse the reader in a story that is as magical and reminiscent as its precursor. Published by Hachette India, the basic concept behind The Maitreya Chronicles series is that of the prophesized saviour or the Maitreya Buddha that is to be born, the Path of the Swan unfolds as a book with this concept at the heart of it, all the action around the first book is necessarily a build up for the prophesized birth of the Messiah. In The Golden Dakini, a series of adventures lead to the birth of the Maitreya Buddha. She plans to do a third book centered on the Maitreya Buddha and his rather eventful youth and his innate spirituality. Charu Singh’s debut novel Path of the Swan, part one of The Maitreya Chronicles, draws from the rich Mahayana culture of Buddhists and the chronicles are a surreal account of the same. She used elements of Tibetan Buddhism especially myths centered around the vajrayana system of Buddhism which is a part of the larger Mahayana body of Buddhism. She especially used the myth centered on the legendry kingdom of Shambala which is particular to Vajrayana Buddhism and is the subject of much debate and thought among monks and lay practitioners of this arm of Buddhism. The book revolves around action building upto the birth of the divine child - the Maitreya Buddha. The divine kingdom of Shambala prophesized the birth of a new age and its saviour – the Maitreya. Destined to be the mother of the Maitreya, Yeshe Nam Lha, the golden dakini, has descended to Earth in the guise of a mortal. Accompanied by her celestial guardians Prince A-Karo and Prince Narasimha, she is to journey to the hidden Mount Meru to fulfil the prophecy. But first Yeshe must choose a suitor, a man fated to become the father of the savior. Her quest takes her through the sleepy towns of Sikkim and Assam to the snowy mountains of Jammu and Leh, encountering along the way a host of magical creatures: the tsen deities who reside in the caves under the Himalayas, the fey warriors of the celestial city of Ney, and the Yakshas, gatekeepers of the hidden tunnels on the way to Mount Meru. But not everyone they meet is benevolent. Prince Arden, leader of the dark Asur forces, is on Yeshe’s trail, hoping to bewitch her once again with his magnetic charm, and Yeshe has to do everything in her power to overcome her earthly mortality and make the right choice.